A refreshing promenade with a leafy canopy, swanky Internet-enabled classrooms with digital projectors, students wearing impeccable uniforms, an astro-turf playground, a five-star dining hall and world-class toilets. One cannot be faulted for imagining this to be a well-heeled private school. Welcome to Government Vocational Higher Secondary School for Girls (GVHSS for Girls), Nadakkavu, a government-run school in southern Kerala’s Kozhikode district. GVHSS began its journey as Main Training School for teachers in 1893. The original building was shattered in a storm in 1934 and a new structure came up in 1938. In 1942 it was upgraded to a High School. The Vocational Higher Secondary Education (VHSE) section was started in 1990. It existed just as any other government school did at that time. Leaky classrooms, not much of an infrastructure, the usual government apathy in granting funds, lack of a good library and playing ground, mediocre academic performance and teachers who got transferred frequently. Around 2006, the local MLA, A Pradeep Kumar of Kozhikode (North) constituency mooted the idea of raising the standards of at least one school to international standards as a gift to his native town. He conceptualized a novel project for ‘Promoting Regional Schools to International Standards through Multiple Intervention’ (PRISM). The project took off in a big way in 2012 when Faizal and Shabana Foundation, a brainchild of NRI industrialist Faizal E. Kottikollon, founder and chairman of Dubai-based KEF Holdings, pitched in with generous funds. The primary attraction of PRISM was multiple interventions. “Various entities like IIM- Kozhikode, Infosys, ISRO, [email protected], NITC, Regional Science Centre Calicut, alumni and individuals have supported this project. The major contribution came from Faizal and Shabana Foundation which raised the school to international standards,” says the MLA. The project also owes its success to government’s liberal financial support. PRISM was given a concrete shape by Prof. Saji Gopinath of IIM-Kozhikode who prepared a project report with the help of IIMK’s in-house social service group. To upgrade the science lab, the MLA approached ISRO, which contributed four labs, at par with the best in any top college. IT giant Infosys also lent its mite with 150 computers. The C.V Raman Centre for Basic Astronomy was launched in the school with support and guidance of Kerala Science and Technology Museum and Priyadarshini Planetarium, Thiruvananthapuram. The novel project identified some basic areas for development, says Ashraf KP, former coordinator of PRISM. “Some of the thrust areas are school ambience, study material and technology; science labs and library; personality development of students; development of creativity and innovative spirit; teachers’ training and physical infrastructure,” he said. PRISM exemplifies how an educational system should be in sync with societal needs. “Our school provides free and quality education to students coming from lower income groups. A large number of our students belong to families of fishermen, labourers and daily wagers,” says Ratheesh K, president of Parent Teachers’ Association. The school’s success story has caught the imagination of the state’s academic community. 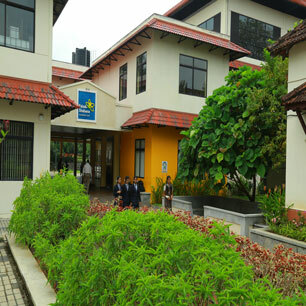 “PRISM has become a role model for all government schools in Kerala. The Faizal and Shabana Foundation is involved in the school activities even today and their support has helped us grow,” says Jaluse K, Principal of VHSE and PRISM Coordinator. The magical transformation draws so many visitors that the school is now building a visitors’ lounge. Visitors included Brazilian soccer legend Ronaldinho and music maestro AR Rahman, who is set to launch a music academy in the school, a testimony to the school’s vibrant cultural leanings. “We continuously improve the academic activities which can be replicated at any school. This project is being implemented in four government schools namely GHSS Karaparamba, GHSS Medical College Campus, GHSS NGO Quarters and Lower Primary School Puthiyangadi in my constituency,” adds Pradeep Kumar, exuding a huge sense of satisfaction. Implementation of PRISM has boosted the academic performance of students while giving a fillip to their overall personality. Their performance in the state board exams are exemplary, hovering around 90 to 95 percent. “PRISM has changed the outlook of the students completely. Majority of them are from poor families but are given quality education without any barriers. Their confidence level and academic performance have increased tremendously,” says the VHSE Principal. Parents too are a happy lot. “My child has passed out from 12th standard and my 2nd daughter is studying in 7th and I am very happy with the school. Their confidence in life has increased thanks to the school,” says Ratheesh. PRISM is making a big impact on the state’s educational landscape. Inspired by the project the state government is implementing a scheme whereby one school each in 140 constituencies will be upgraded to global standards. Rs 1000 crore will be set aside for this and Rs. 250 crores is being spent this year. Have you ever heard of a CPM MLA, a Dubai-based NRI businessman, a top management school, an IT giant, scientific organizations, an Oscar winning musician, state authorities, civic corporation, and alumni coming together to raise a government-run school to world standards? Well, if not, come to Kozhikode. Seeing is believing!